How do Voltage Optimisers Work? Voltage Optimisers reduce the amount of voltage supplied to your electrical circuits and machinery. This careful voltage reduction results in lower energy consumption and carbon emissions. 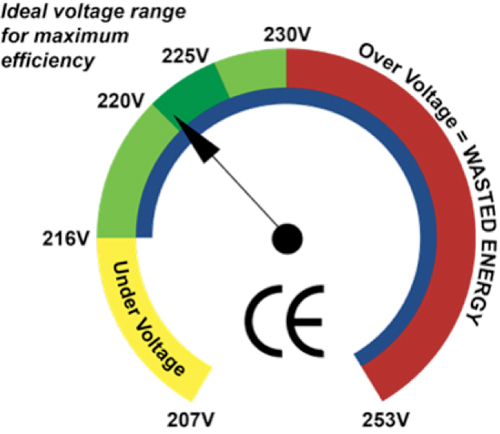 Typically in the UK, voltage is supplied between 240v – 253v to our homes and workplace. This supply voltage is higher than our appliances and machinery require to operate. The diagram below shows the allowable voltage range for appliances and machinery throughout Europe. The red section illustrates the UK voltage supplied by your energy provider. Voltage Optimisers reduce your voltage to a lower more efficient level. Our Voltage Optimisers are manufactured in the UK and have been reducing bills for large businesses since 2002, and our customers come from a wide range of industries from light commercial to heavy industrial facilities. To find out more information, contact us today!